For this phase 2 trial, researchers are evaluating the efficacy and safety of andecaliximab (GS-5745) and nivolumab vs nivolumab alone. Description: For this phase 2, randomized, 2-armed trial (ClinicalTrials.gov Identifier: NCT02864381), researchers are evaluating the efficacy and safety of andecaliximab (GS-5745) and nivolumab vs nivolumab alone among patients with unresectable or recurrent gastroesophageal junction or gastric cancer. Patients must have inoperable, locally advanced or metastatic disease that progressed after at least 1 prior therapy. 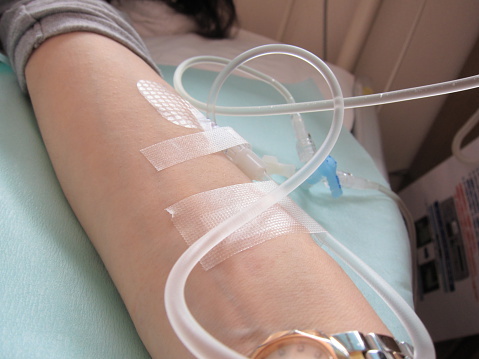 The study has 2 arms: in the first, patients will receive andecaliximab 800 mg intravenously every 2 weeks plus intravenous nivolumab 3 mg/kg every 2 weeks; in the second, patients will receive intravenous nivolumab 3 mg/kg every 2 weeks. The primary outcome is overall response rate; secondary outcomes include progression-free survival, overall survival, duration of response, and frequency/variety of adverse events. For more study information, including detailed inclusion and exclusion criteria, study locations, and contact information, visit https://clinicaltrials.gov/ct2/show/NCT02864381. Status: This study is open and recruiting participants as of April 7, 2017. This study is sponsored by Gilead Sciences. Andecaliximab is a humanized monoclonal antibody that targets matrix metalloproteinase 9 (MMP-9). Clinicaltrials.gov. Andecaliximab combined with nivolumab versus nivolumab alone in adults with unresectable or recurrent gastric or gastroesophageal junction adenocarcinoma. NCT02864381. https://clinicaltrials.gov/ct2/show/NCT02864381. Accessed April 7, 2017.